148 young people start their apprenticeships in Germany & at other locations, including America for the first time. Tognum has taken the German version of cooperative education to the U.S. for the first time and is applying it at its subsidiary, Tognum America. ”We develop, produce and maintain state-of-the-art engines and energy systems, and to do this, we need qualified staff. With this investment in the future, the company is making an important contribution to counteract the lack of specialists,” explained Ingo Metzer, Head of HR at Tognum. 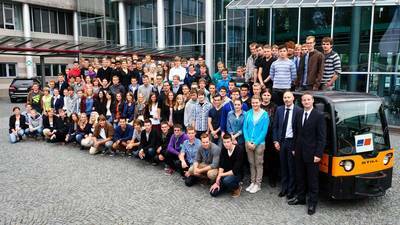 The vast majority of the career starters, amounting to 108 young people, will receive training at the lead plant in Friedrichshafen, which has increased the number of apprentice positions by 21 percent compared with the previous year 2011. A new addition to Tognum’s training program is the Bachelor of Engineering, with a specialization in Production & Management and the Bachelor of Engineering in Computer Science with a specialization in Telecommunications. For the first time, Tognum America is providing training in industrial engineering for six new recruits at its Aiken County, South Carolina location. The program, which has been prepared in collaboration with the Aiken County School District, the Aiken County Career and Technology Center and the Aiken Technical College, combines High School education, engineering courses in class and practical training in the MTU Aiken Plant, and is based on the standard cooperative education concept in use in Germany. It impressed U.S. educators so much that representatives of Tognum America were invited to the White House to present the concept. And since the beginning of 2012, five apprentices at MTU South Africa have been learning the finer points of engine assembly and engine service. Three young people have started on their professional career at Tognum Asia.